Offer good 08/07/14-08/13/14 Limited to stock on hand. THE BEST 5.56 NATO AR PLATFORM IN THE WORLD! Create a registration database of all ammunition vendors, purchasers, and purchases. Effectively ban online ammo sales as we know it. Mandate another costly license for gun owners and ammo sellers to acquire. Eliminate thousands of ammunition “points of purchase” in the state and significantly increase the cost for law-abiding people to exercise their fundamental Second Amendment rights. Eradicate thousands of California businesses currently engaging in the lawful sales of ammunition for self-defense and sporting purposes at the cost of potentially thousands of jobs and millions of dollars in lost state and local tax revenues. CLICK HERE FOR A COMPLETE RUN DOWN ON THE PROCESS. OPTICSNOW AVAILABLE! AT YOUR BEST STOCKED GUN STORE IN LOS ANGELES. 100's of AGOG'S AND ACCUPOINTS IN STOCK! 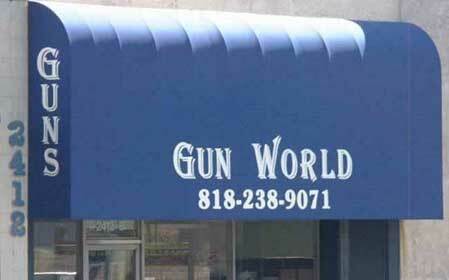 Gun World has one of the largest firearm inventories in California. We have over 500 firearms on display. We specialize in hard to find and unique firearms. These are some of the manufactures we carry on display and in stock. Benchmade, Benelli, Beretta, Blackhawk, Browning, BSA Optics, Burris, Charter Arms, Christensen Arms, Cobra, Colt, CZ, Del-ton, DPMS, EDM Arms, Ed Brown, EOTech, FNH, Franchi, H&K, Glock, Kahr, Kimber, Les Baer, Leupold, LWRC, Lewis Machine and Tool (LMT), Magpul, Marlin, Mossberg, Night Force Optics, Night Hawk Custom, Noveske, Remington, Rock Island Armory, Rossi, Ruger, Sako, Sig Sauer, Smith & Wesson, Springfield, Stag Arms, Stoeger, Streamlight, Taser, Taurus, Tikka, Trijicon, Uberti, Viridian, Wilson Combat, Winchester and more. If we can't find it chances are it's not available. We also buy, sell and consign used firearms. From one firearm to whole collections, let us make you an offer. Take Aim At These Featured Products!